If you like to indulge in a cold beer it can be the most frustrating thing when you’re stuck with a warm one. According to South African Breweries if beer is at correct temperature it helps you taste it better. The rule of thumb is that a light body and low alcohol beer tastes better cold, while a fully body and high alcohol beer tastes better warmer. The ideal temperature to serve a cold one is between 4 and 8-degrees Celsius. This is the beauty of chemistry, because if there’s one thing science can help us with it’s thermodynamics. If you don’t want to wait up to 30 minutes to quench your thirst try this basic and practical technique to cool your drink down in less than 15 minutes. 1. Fill a container or cooler-box with ice, enough water and lots of salt. 2. Submerge the cans and/or bottles in the cooler completely. 4. Rinse the bottle in cold water* and enjoy your chilled beer responsibly. The more salt you add the better. Here’s why: The salt lowers the freezing point of water significantly. Table salt breaks down into sodium chloride ions which physically interfere with water molecules’ ability to form ice. You’ll notice the ice melt faster because the salt dissolves into the water of the ice cube. Salt water freezes at a lower temperature than the 0-degree Celsius at which freshwater freezes. 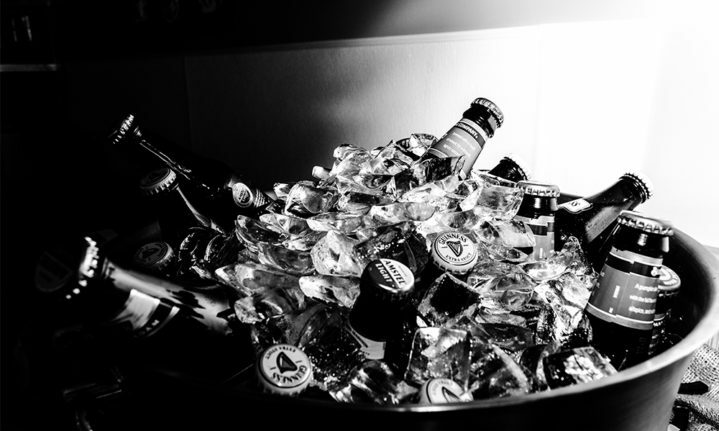 The salty ice water’s temperature won’t increase like it would in fresh water, instead it will keep the water well below 0-degree Celsius, chilling your beer faster. *if you’re living in a drought-stricken area, remember to use water sparingly.